t*rexes and tiaras: Painted smile, chin up from the ground.. This is a fairly typical outfit for me over the past couple of weeks, whilst the weather has been cold and rainy. I have been layering jumpers over dresses as though it's my new obsession. It isn't, really, but it's been a nice way to keep the chill off. We had a flurry of snow this morning, which was quite exciting, but it only lasted half an hour and is now gone. Gutted. 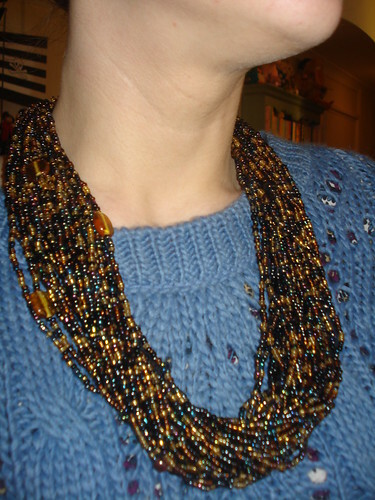 This pretty beaded necklace was one of my lovely gifts from my swap partner in the Secret Santa swap I did. I know there is sadly still one parcel we are waiting to get back to the sender, but other than that I think it went well and everyone ended up with a parcel - let me know if you didn't get one?! Thank you to all who took part, as we had more this year than any other. That's a pretty jumper. I really like the lacy pattern. 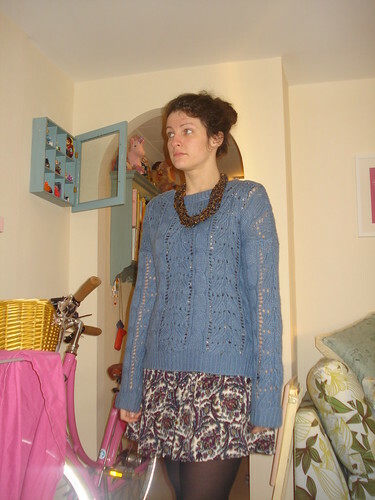 I love the jumper over a dress look, takes me back to my student days when I was thin. You manage to make it look far more sophisticated than I ever did. Oh gosh, do you think? I feel as though it's mostly unruly! That necklace is lovely. I got a really cute button necklace from my secret Santa. I featured it on my blog recently. Thanks for organising it, it was lovely to receive something completely unexpected. NO problem - I think it went pretty well on the whole. Just a couple of parcels which are being returned to sender, very sloooowly. 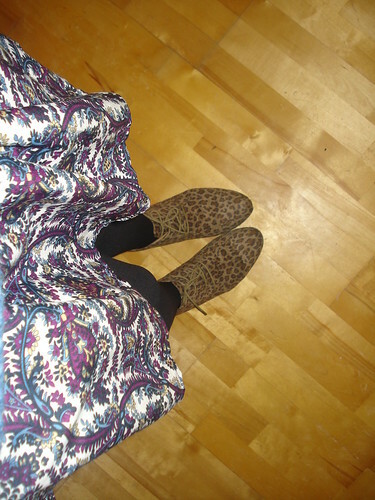 those leopard print shoes are fantastic!! I love layering jumpers over dresses; it's so simple, but effective! I can't believe we've not had any snow yet this Winter! After so much snow over the last few winters, I hoped we'd have a similar winter again, but nope: just months of rain! Lol. I really hope we get a decent snowfall before it turns to Spring, but I can't wait for Spring at the same time. I don't think we are going to get any snow now.